Updated to Designer and Photo 1.6, really loving the new features making the already fabulous programs even more fabulous! Thank you to all involved and for the free stuff as well! Just had 1 question though. In the previous versions of Designer and Photo, there was an option to have the transform functions (rotate, flip vertical, flip horizontal, etc) in the menu bar (I think that's what it's called? I'm on my phone right now so don't have the program open in front of me) as a shortcut. Now in version 1.6, the shortcut is no longer there and when I try and edit the menu bar I don't see the icons there either. Is this a shortcut you removed or am I just not seeing the icons? Hope I explained that well enough. What, you mean these buttons ? It is called the Toolbar. Yes, the same on Windows but those buttons should be there by default. Yes, that's what I mean. Ah it's called the toolbar, not menu bar. Thank you! If the buttons are not there, follow the procedures posted by Scungio, above. I'm on a Mac too. I did what you said and I got all the icons like "arrange" "align" etc to customise like on your screen, but I can find all the "transform" "flip" etc icons. They are all there except the 4 "transform" ones which I used to use all the time on 1.5. It must be an error on my end since everyone else still has them. Maybe I'm just not seeing them haha. Thanks for the help, I'll keep playing around with the toolbar and see if I can find them. The buttons are not there, I tried to follow with what Scungio posted but still no luck. Are you sure you haven't "lost" them off the right edge of the screen ? Try clicking on the little "Fast forward" button, if there. if so you will have to "re-organize"
Hi, I've tried to follow directions, but unfortunately i haven't managed to solve the problem. In customising toolbar, I go to Edit... then Defaults... then to Synchronise from server. But the icons don't allow me to highlight and make the required changes? Synchronise from "Selection" sets the default line and fill colours of vector shapes. So if your selection had a red line and a yellow fill, synchronising would use that for all future shapes you draw. If you want to restore everything (master reset) quit the program, hold down the Control key (PC) and run the program again. Keep the Control key held down until you get the reset window. Bear in mind that this is quite brutal, you will lose custom settings, brushes etc. Although I guess you wont have had time to do much customising yet with the 1.6 upgrade. The ICONS are missing on the desktop version of PHOTO but are available on the iPad version. 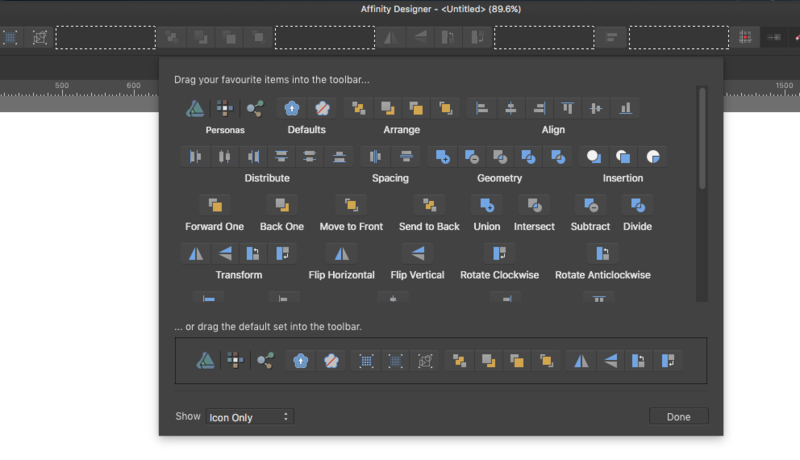 The posts above are under Affinity Photo but then the screen shots are only valid for DESIGNER. So team, where are those pesky icons for PHOTO DESKTOP version? The functionality is there (on the Arrange menu) but for some reason there is no button group for them available among the Customize Toolbar options. 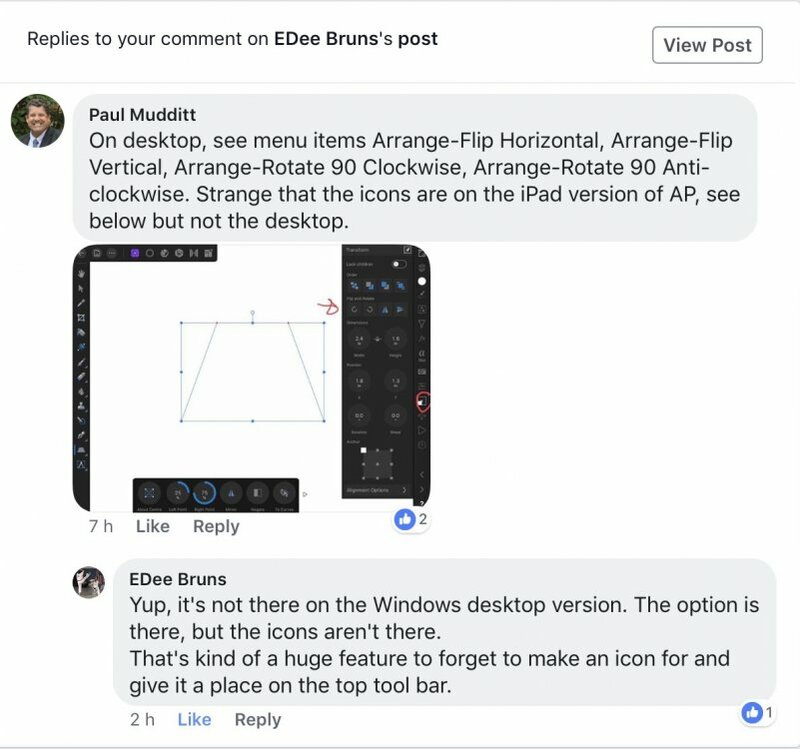 I have no idea why that was omitted from the desktop Photo app, but if there is not already a feature request for that in the Feature Requests & Feedback > Suggestions for Affinity Photo on Desktop sub-forum, there should be.